(transitive) When you take something (a library book, a loan) for temporary use from a formal establishment. Synonyms are rent, obtain, or acquire. I took out a loan to help pay for my tuition. Instead of buying that new book, you can take it out from the library. I was able to take out a mortgage to buy my first house. (transitive) When something is extracted or removed from its current place. Synonyms are expel or withdraw. I had to have two teeth taken out. He took out his phone and recorded her phone number. I need to take my car out of the garage. The trash smells bad. Can you take it out please? Have you had your appendix taken out? (transitive) When you go out with someone, often on a date but also just as company. Synonyms include woo or court. Where did he take you out last night? On our first date, Mark took me out to the cinema. Jenny takes me out to a new restaurant every weekend. Let me take you out to dinner some time. 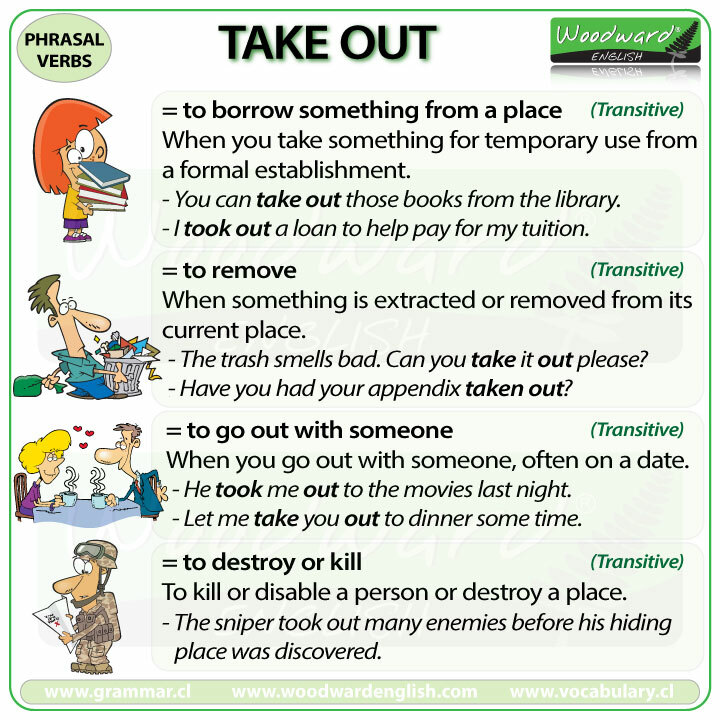 (transitive – informal) to kill or disable a person or destroy a place. They took out the enemy base with long range missiles. The sniper took out many soldiers before his hiding place was discovered.